Are you ready to enter into the exciting world of bartending by attending a Bar School in Maryland? This page gives you some of the basic information you'll need to know to in order to start your bartending career today. 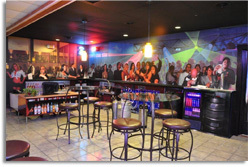 Maryland Bartending Academy has been the top bartending school in the Baltimore-DC metro area for decades. And whether you need to learn the basics of bartending, how to manage a crowd and earn the best bartender wage, expert mixology techniques, or learn flashy trick bartending, Maryland Bartending Academy can help you gain the experience and the professional skills to start a new career or a fun second job. What Do I Gain From Bar School in Maryland? To put it simply, you get the qualifications for the very best bartender employment. Bartending Schools are the way the professionals start their careers, obtaining the bartender training, knowledge, and skills, to take off in their chosen career. Bartending is a skill that goes beyond merely learning what liquors goes into each drink (though that is certainly important); it is also about practice, experience, and the things you cannot learn in a book. Mixology- Our teachers will ensure that you can make everything from the Tom Collins (which an older customer would order) to Jagerbombs (popular amongst the college crowd). Bartender License- Maryland laws do not require a technical "license" per se, but they do require you to take alcohol awareness classes. Your tuition at Maryland Bartending Academy includes the mandatory training class. Bartending Certificate- Upon graduation you will receive a certificate which Maryland bartending employers universally recognized as a key indicator for success in the field. Managing the Crowd- The best way to make more as a bartender is to get the tips you deserve for your hard work. At a professional bar school, you will learn the ins and outs of the real bartending world, and how to make the most of your time behind the counter. Trick Bartending- Also known as "flair", trick bartending is one of the most exciting features of our bartending classes. You will learn how to play the crowd, impress your bosses, and possibly move up to the most exclusive bars in town.